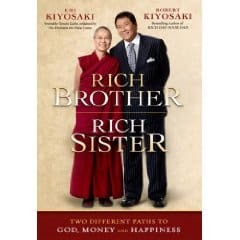 Robert Kiyosaki is at it again with another book titled Rich Brother Rich Sister – Two Different Paths to God, Money and Happiness. Did you know that Mr. Kiyosaki’s book “Rich Dad Poor Dad” has been on the New York Best Sellers list for the past 7 years? I’m one of the many who have read Rich Dad Poor Dad and although it doesn’t explain a lot about “how” to get rich, it does have a lot of value in explaining how rich people think. Rich Brother Rich Sister is written by two people, Robert Kiyosaki and his sister Emi Kiyosaki. Most of us know who Robert Kiyosaki is. He is the author of international best seller of the Rich Dad Poor Dad series of books along with being a real estate investor. However, who is Emi Kiyosaki? Emi took an entirely different path than Robert. While Mr. Kiyosaki took the path of financial greatness, Emi followed a spiritual path and was ordained (by the Dalai Lama) as a Buddhist nun. What is Rich Brother Rich Sister about? This book is a little different than Robert Kiyosaki’s other books where Rich Brother Rich Sister is more of a biography and personal development guide than a “financial book”. It contains many life lessons that I think that we can all learn from. It starts off with what Robert and Emi Kiyosaki were like as children and how they grew up during World War II. The story evolves into how they both went on their own separate paths and the struggles that they went through to get to where they are today. Each chapter contains perspectives from both Robert and his sister. What I found refreshing was that both authors humbly admit their faults and what they have learned from them. For example, with Robert, he admitted to having a dark side along with being discharged from the U.S Army. Emi, she went through many struggles in life (both financial and health) which mainly stem from her trying to find her path in life. For those of you who have already read “Rich Dad Poor Dad” or the “Cash Flow Quadrant“, this book helps put depth into what Robert Kiyosaki preaches and why he believes so strongly in what he does. If you’re anything like me, you’ve questioned if you’re doing what you’re supposed to be doing. This book helps answer that question in describing how two siblings found their path to a fulfilling life and their lessons on how they both got there. Simply leave a comment and you’ll automatically be entered in the draw for a free copy. Only those with a North American mailing address may enter (publisher rules, sorry). Contest will end Thursday 5pm EST Jan 22, 2009 and the winner announced shortly afterward! Anything written by Kiyosaki typically turns me off, but his sister sounds pretty interesting. I’m in. I read the Rich Dad book and while it isn’t a book I recommend to friends who want to learn about finances, anytime I read a book I do tend to learn something. I’m intrigued, and want to know more about Emi. Sounds like it would be an interesting read; two siblings “enriching” their lives in different ways. I love a free book! Pick me! Kiyosaki’s columns on Yahoo Finance are nice and topical too. I’d like to add this to my collection of rich dad books. I wish I would as rich as my sisters too, after reading this book! Rich Dad is a great series, I would love to add it to my collection. I have always wanted to try the board game. Seems like a nice read. Please count me in. seems like an interesting read – I am happy to read free books. My goal this year is to educate myself by increasing the number of good books I read each month…this one will be on that list. I did enjoy reading the the Rich Dad series books. Especially the original book. I learn better when I read stories and life experiences and Robert does a really good job in writing all of that. I think his main message from most of his books is that, if you want to get rich, you should build a business and start investing. Sometimes I feel that the message is the same for all his books. Same message, different words. I hope this one brings something fresh. But he’s good at selling, because I am going to buy it anyways.. If I don’t win it. sounds like a good book to read! I don’t want the book, because Kiyosaki is a hack. I’m interested if the stories told in this one (I assume his sister can keep him honest) match up with the ‘stories’ he tells in his other novels. I have appreciated the insites of how “successful” people think and would enjoy reading about the events and history that helped to shape such a gifted man. Free book sounds good to me!! Here is for the opportunity to own my first finance related book. Thanks for the opportunity! Sounds like an interesting book. I find Mr. Kiyosaki very interesting and I would love to read more of him and to find out more of his sister. It’s amazing how he took the road to money wealth and his sister took the road to spiritual wealth. Please count me in to win this interesting, alluring book. I like ‘Rich Dad..’ because of the fundamental financial principals explained in a very simple language…hoping that this book has something more to it. I liked the Rich Dad books (you just have to take it with a grain of salt) so I guess this one is worth a read. Thanks for the opportunity, it looks like it would be a great book to win! I’m amazed that people love the Rich Dad series. There’s no substance; it’s all inspirational. For anyone who hasn’t read “Rich Dad, Poor Dad”, it’s definitely a “library rental”. It’s really sad to me that it has been a best seller for so long. Look, people don’t want to be “rich”, they want to be “financially independent”. People don’t want to “retire”, they want to be “financially independent” so they don’t have work any more (or as much). We don’t want “money”, we want the quality of life that money brings. For a more lucid and practical book about this concept, see “Killing Sacred Cows”. Looks like an interesting read. Sign me up as well. Is Obama the secret word? sign me up and keep up the good work! Probably a good book …i’ve enjoyed his other ones. I’m looking forward to a book that sounds inspiring but leaves you just as confused as before you picked it up. Lots of interesting concepts but no meat on the bones. pick me please. God bless Obama. also in for a free copy! I am curious about the ‘rich sister’ s philosophy..! I would love to read the book, thanks! That looks like a good read. Consider me entering. I’ve never read anything by either of them even though I have heard of Robert Kiyosaki. The journey sounds interesting! Let’s face it: the Anglo-Saxon financial and economic models are broken. Whatever understanding the Kiyosakis might contribute is welcome. great promotion for a very informative book! good luck to all!! Interesting. I’ve actually put off reading Kiyosaki books before because I’ve heard many negative reviews and the small parts I have read seemed a little overly focused on money rather than developing a life you can respect. But now with the input of his sister, this sounds like it may give a lot more detail about whether the “rich life” is the way to go rather than how to get there. Having read many of his other books, this should offer more insight. Thanks! It sounds an interesting read written by siblings so different! I have read Rich Dad, Poor Dad and I am interested in reading this as well. Count me in! I liked the Rich Dad Poor Dad book, as it helped open my eyes to the real road to riches. I really liked the Rich Dad Poor Dad book. Although I’m expecting something very different from this one, it also seems pretty interesting. I’ve read many of his books, but I’m not terribly impressed with his approach. Way back when I first read one of his books, it was the first time I’d been introduced to multiple streams of income. I’m glad for learning about that. His books always left me with negative feelings though. After reading what he had to say, I think I’d prefer to go my own way rather than use his methods. I found that John Reed had some interesting findings on Kiyosaki and his books. He wrote quite a lengthy review. He’s a journalist at heart, and writes reviews of authors in the real estate space. For some people education is second to motivation. Putting money into the perspective of livng a good life is a timely topic. I’d appreciate the perspective of this book. Looks like a great book, I’ll probably give it a read! I’d love to have this book! Thanks for the introduction to this book, sounds like it would be a very interesting read. Thanks as well for another great giveaway. I agree with post #70–he has made his money from books and from what I understand not so much from real estate. I always like a good finance read, though, and keep the thinking critical when you read anything. I would love the get a free copy. Unlike most readers, I am quite inspired by Rich Dad, Poor Dad. It gave me a whole new perspective about how to change my thinking towards my financial independence. There are lot of things to learn from his stories and from his books. Please count me in for the draw. Sounds like a great read – hope I win a copy! This book sounds like another great addition to the collection! Thanks for your info. I’d like to be entered into the draw as well! Could be an interesting read! This could be an interesting read. I have heard great things of the rich dad poor dad series. Having just been to a “Learn to be rich ” seminar put on by the rich dad organization, it left a really sour taste in my mouth. I hope this read wil reaffirm his teachings. IF IT IS LIKE HIS PREVIOUS BOOK:” RICH DAD POOR DAD” , ROBERT KIYOSAKI HAS ANOTHER BEST SELLER. I LIKE THE WAY ROBERT GOES TO HIS PERSONAL LIFE EXPERINCES TO EXPLAIN, HOW THE SEEDS OF FUTURE SUCCESS ARE PLANTED AND NUTURE FOR FUTURE HARVEST OR SUCCESS IN HIS LATER LIFE. I wonder if this book will impress me more than the Cashflow quadrant did. Some good ideas there, but it was mostly filler. Who knows, maybe this will be radically different. Read one of his books earlier on and it helped me understand most things about Real Estate. Keep up the good work – I read you daily. Sounds like a good read. Count me in! I enjoyed rich dad, poor dad, count me in! Wow, 99 comments and counting. Count me in. Just learning to get back on my financial feet, and every little bit helps. I’m in on the contest, I could use a good read. It would be great to read his new book ! Count me in. Sounds like a great book to read!! Please count me in – thank you! It looks pretty interesting. I am in. Thanks. Man, I sure could use some financial help. I think this book is a step in the right direction. I read Rich Dad Poor Dad and gained a new perspective. As a father of 3 with a single income, I often feel locked onto the path of financial gain, of being a good provider. I often wonder if I chose the right path, or if living with less, but a more spiritual focus would have been a better choice. This sounds like a book that would be very much in tune with my thoughts. Thanks for the opportunity. I’m in! Thanks for running the give-away! Looks like an interesting read. Wow! Thank you so much for taking the time to share your experiences with us. I am already learning so much! It would be nice to have the Rich Brother, Rich Sister book. Whether I win or not, I enjoy reading and learning about your journey towards financial freedom. I always read your blog. Thanks! Thanks for the giveaway; would love to win the copy! Sounds like another good book from Robert. This book would go great next to The Wealthy Barber on my book shelf. sign me up….anything free, sounds good to me! I did read his first book and I agree that, even though it frustrated me in that he didn’t provide any details on how to get rich today, it definitely provided me with a new way to look at finances, assets, investing and cashflow. Although I don’t expect this to provide me with any additional financial knowledge, I’m still curious to read about how two siblings lead two completely different lives. Robert Kiyosaki must be doing something right, as he tends to completely polarize people. I think his books are simply meant to get people to change their attitudes about and habits around money, as opposed to being “how tos”. Anyways, hope I win a copy of this book! Thanks. Previous post: 6 Reasons Why Recessions are a Good Thing!